Arrival Plaza and Central Lodge The plaza steps out to welcome and direct guests to the centrally located lodge, which faces the drive, creating a focal point to the compact village. 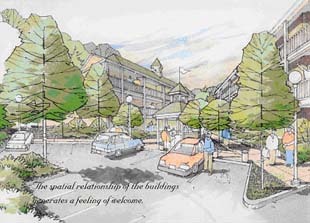 Conceptual Plan Thirty buildings are arranged in three ‘neighborhood’ clusters while separating human-scaled pedestrian courts from car courts. 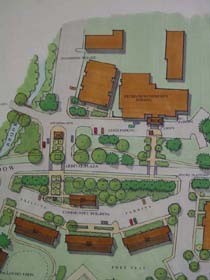 Detailed strategies, for parking, landscape, and pedestrian walks ensure a positive experience for all visitors. 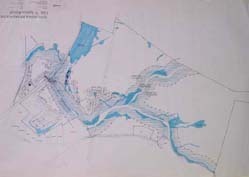 Wetland Protection Careful delineation of water and wetland boundaries and other key natural features create “no-build” zones early in the WCA design process. 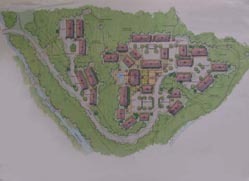 WCA provided master planning services for this time-share resort village in southern Berkshire County. The challenge was to site new buildings, recreational facilities, and circulation systems while protecting open space on a steeply sloping and very constrained site. 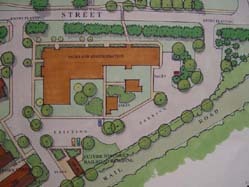 The resulting master plan preserves a maximum amount of existing forest and wetlands while gracefully integrating a complex set of program requirements. 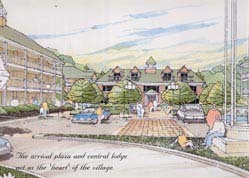 The existing village was also redesigned to improve a welcoming entrance. 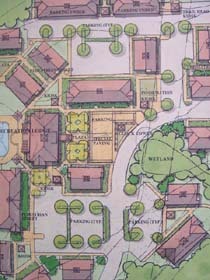 WCA shepherded this high-profile project through official review and vocal public hearing with a firm and balanced hand. 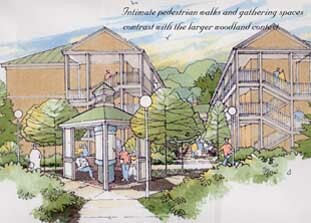 Outdoor rooms Road entrance, parking, walks, landscape, and lighting redesign were undertaken to improve the hospitality of the existing village. Human scale outdoor rooms are carefully appointed to serve the destination functions of the Resort.